Located in the heart of St. Vincent Place, just off of George Square, Urban Bar & Brasserie always struck me as a little bit of a tourist trap from the outside. Given it’s look and location, it was easy to see how those unfamiliar with the city could pass by and be drawn in by it’s cool, attractive exterior. 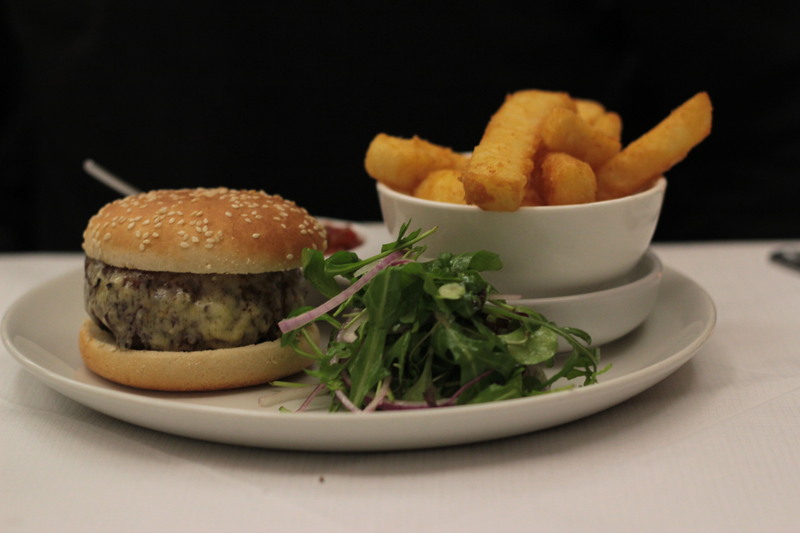 That particular area of Glasgow’s city centre is not one that is known for great burgers; however, we were looking to try something a little different and decided to stop by and take advantage of a three course lunch menu – once we had checked that there was a burger on offer, obviously! Inside, Urban looks like the product of two starkly different restaurants that have been combined together. Most of the venue is dimly lit with low lighting and candles. There are tables tucked away in corners and our first impression was that it actually felt quite cozy, which surprised us given it’s prime location. Once you get to the bar area; however, you’ll notice a huge white dining room area, which is open plan and brightly lit to the point of feeling a little clinical. It’s a stark and strange contrast to the rest of the restaurant, but overall it’s a very nice setting for a meal. Halfway through our visit, the lights in the square hall area were turned down to match the rest of the restaurant, presumably as dinner service was about to begin. We’ve got no idea who Michael is (we’re going to presume that he’s a chef at Urban), but we were eager to try his burger creation, which is topped with cheese and served on a toasted bun with cucumber relish and fries. We’re not the biggest fans of cucumber and I was curious as to how well it would work on a slab of minced beef. Fortunately, it worked well and was absolutely delicious! I didn’t really get any hints of cucumber from it, but more of a tomato relish flavour with a slightly spicy kick. There were ever so slight hints of cucumber and for us, that was a good thing. 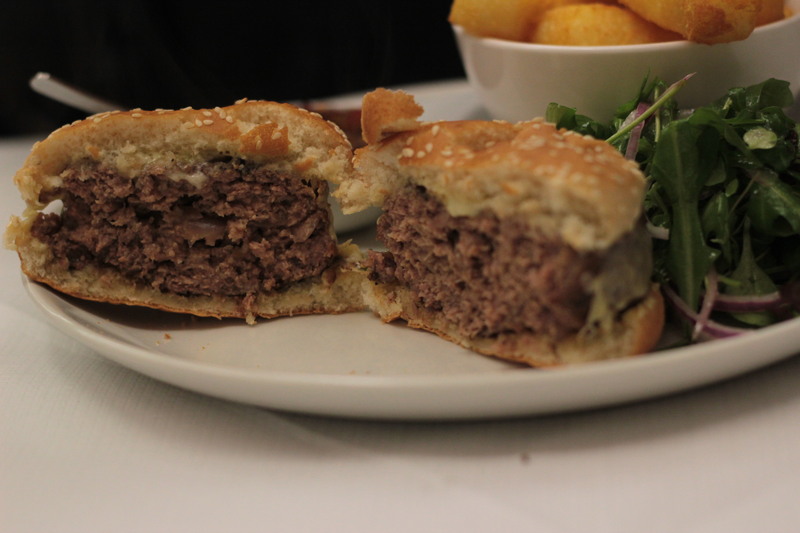 The patty itself was a good size and was quite juicy, but taste-wise, it lacked any real depth. There wasn’t much in the way of seasoning going on here and while I certainly wouldn’t describe the patty as bad, it did little to grab anyone’s attention. Halfway through, I struggled to pinpoint any standout flavours and it just felt like I was eating a pretty standard, forgettable burger. The patty was under seasoned; however, the weakest part of the burger was the bun. It resembled a bog standard bun that anyone could go out and buy from their local supermarket’s frozen aisle and when I tried to lift the top half of it off to add the relish, the bun stuck to the patty and left a layer of bread on top of the meat that I was unable to remove. This was partly due to the patty being extremely hot; however, a good bun wouldn’t immediately crumble like that. The presentation was first class and despite the bun being poor quality, the size of it housed everything perfectly, almost like it was made to fit the patty. Unfortunately, it didn’t do a good job of staying together and began to collapse quite quickly. 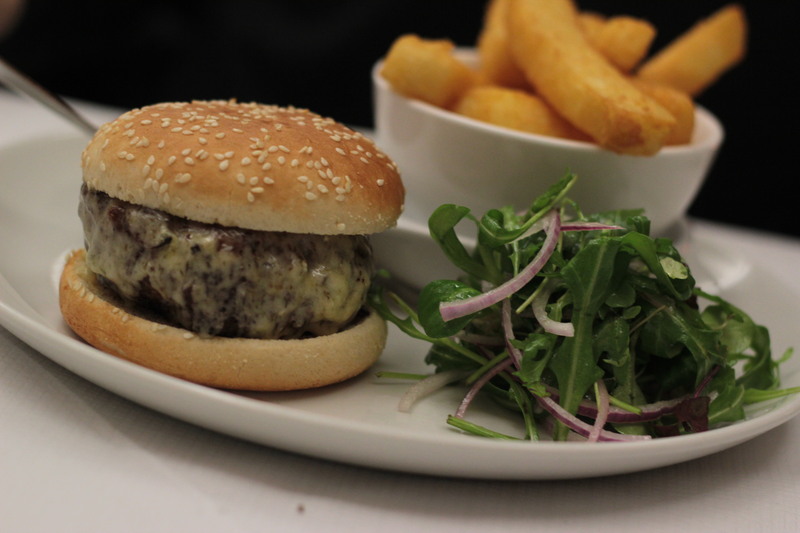 The burger was served with hand-cut chunky fries which were absolutely delicious. Beautifully crispy on the outside and soft on the inside. Perfect, but the fries should never be better than the burger you are eating along with it. I felt quite torn as I left Urban. The patty was well cooked and I felt that had it just been seasoned well and housed inside a better bun, this could have been a really good burger. As mentioned, the burger was part of a three course lunch deal and aside from that one course, I couldn’t pick a fault with anything else. The starters and desserts were first class, the service was friendly and the surroundings relaxing and I’d probably go back to eat there again. If you stop by for a lunch deal; however, skip the burger and get something else instead. – Patty wasn’t well seasoned and was quite bland.